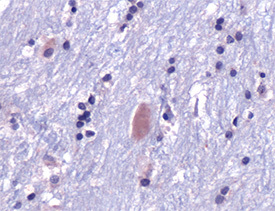 Immunogen: Recombinant full length human ubiquitin protein. Specificity: Recognizes ubiquitin-protein conjugates and free ubiquitin. Human tested, other species based on homology. Formulation: Liquid. In PBS, pH 7.6, containing 1% BSA and less than 0.1% sodium azide. Scientific Background: Ubiquitin (Ub) plays a very important role in regulated non-lysosomal ATP dependent protein degradation. The protein to be degraded is conjugated to Ub and the ubiquinated protein is then selectively degraded by a 26S complex, multicatalytic cytosolic and nuclear protease termed proteasome. The Ub-proteasome proteolytic pathway, which is a complex process, is implicated to be of great importance for regulating numerous cellular processes. 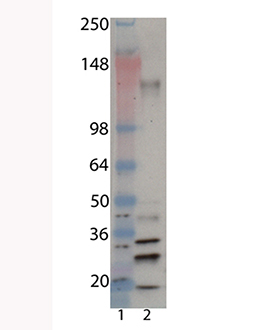 Western blot analysis of Ubiquitin-protein conjugates, pAb (Prod. No. BML-UG9511-0100): Lane 1: MW marker, Lane 2: Poly-ubiquitin chains (Ub2-7) (K48-linked) (Prod. No. BML-UW8860).